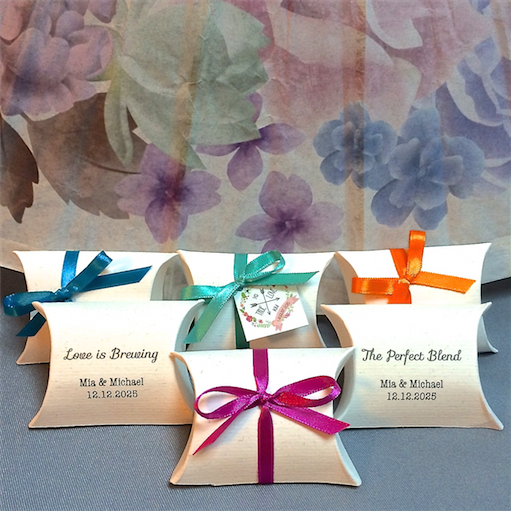 Tea favors are well received by all guests. Allerines Premium Tea Favors are sure to please, brewing together tradition, taste, quality and beauty in each gift filling the room with its dainty aromas. Choose to relax, revitalise or bring health upon your guests after a long festive night. You might just find the right choice here! Packaging: Each individual tea pyramid is packaged in a food safe sealed bag, and presented in a white pillow box. Choose your personalization option, and any two combination of tea flavors per gift! Strawberry Shortcake: Black ceylon tea, white chocolate, strawberry & cream flavoring, strawberry pieces, Roman chamomile flowers. Pear-fect Oolong: Formosa oolong, ti kuan yin, osmanthus oolong, pear, rose, and aloe flavoring. A pear-fect choice from the pear-fect couple! Sakura: Green sencha tea, green jasmine tea, cherry pieces, rose hip skin, jasmine flowers, peonies and roses. Mango Tango: Green sencha tea, cylon tea, purple cornflowers, lemon myrtle leaves, orange peel and mango pieces. African Sunrise: Organic Rooibos, blackcurrants, blackberry leaves, rose and mullein flowers and pieces of strawberry. - 2 weeks production time. Depending on quantity, please allow further preparation time. Personalized tags: choose from our range of tags for the bow & tag design option, or email us your own design. Personalized tags inclusive at no extra cost when you purchase them for Allerines Premium Tea Favors!